pilgrimage | XKV8R: The Official Blog of Robert R. Cargill, Ph.D. In the wake of yesterday’s post, “No, no, you DIDN’T find the Holy Grail,” I thought I’d take a moment to spell out what I believe to be the driving forces behind the constant need on the part of some to hunt for Christian relics. For the purposes of this article, I define “relics” as both the physical remains of venerated individuals and the objects associated with them. The reasons people seek out and claim discovery of relics can be boiled down to two general categories: money (including fame) and a confirmation of one’s faith (including hope and healing). Let’s deal with the obvious reason first: money. Religious relics are a HUGE business. Anyone who has ever traveled to Jerusalem or Rome can attest to just how influential religious tourism is in these regions, and how essential it is to their respective local economies. The spectrum of souvenirs sold by local shops ranges from ubiquitous pieces of artwork and religious literature on the one end, to much rarer objects like antiquities (both legal and illicit), and yes, relics and rumored relics on the other end. But the money isn’t just made by shopkeepers and antiquities dealers; churches and museums (which are often one-in-the-same) bring in HUGE tourism dollars from pilgrims who will fork over large sums of money to view something that confirms their faith. (We’ll deal with confirmation of faith in a moment.) There are tickets to be sold and refurbishments of chapels to be paid for, and possession of a relic is one quick and easy way to attract both pilgrims and profits. But money made from relics isn’t limited to those who possess the relics; authors of books and producers of television documentaries can make thousands, and sometimes millions of dollars producing literary and video content about the relics, even if they themselves do not possess them. Toss in an effective marketing strategy – one which almost always includes releasing the book or film (or both) on or around Easter or Christmas – and publishers can sell tens of thousands of copies of speculative books, and producers can sell sensationalized, factually-challenged documentaries to ratings-hungry cable networks, who are increasingly replacing substantive history programs with reality adventure fiction. Thus, the business of relic hunts is one of the main driving forces behind the continued claims of holy relics. The second reason relics are so popular is due to their role in confirming the faith of believers. The fact is that people like to give their faith something tangible. In a world increasingly reliant upon evidence and verifiable data, relics offer a form of spiritual “evidence” that confirms one’s beliefs. People of faith crave evidence confirming the person of Jesus as well as the claims made about him. But the desire for evidence is not a modern phenomenon. We must remember that there is absolutely zero archaeological evidence that points to the existence of Jesus, and much less so that supports the claims made about him, such as his divinity, his miraculous powers, etc. And as for literary evidence, outside of the biblical text, there are no authentic references to Jesus from the first century CE. None! Thus, because of the lack of outside literary and physical evidence of Jesus and of the claims made about him in the biblical texts, early Christians sought out other various forms of “evidence” that could prove, at least to them, that Jesus was who he claimed to be. And this desire to find and confirm relics associated with Jesus was not limited to the poor Christian populace, but was an endeavor undertaken at that highest levels of authority, exemplified perhaps no better than by Helena, the mother of the Emperor Constantine, who made pilgrimages to Jerusalem for the express purpose of acquiring Christian relics and memorializing the locations of significant moments in the life of Jesus by building chapels on them. For this reason, Christian relics – especially those associated with Jesus like the “nails of the cross“, pieces of the “true cross“, the “holy spear” used to pierce his side, his burial shroud, and even fragments from his supposed tomb, etc. – have been the focus of scrutiny (and many, many books and documentaries) over the years. Relics allow Christians to touch what they believe to be evidence of Jesus, thereby confirming their faith. Included within this confirmation of faith is the ancient belief that objects associated with Jesus possessed miraculous powers, and principal among them, healing powers. This tradition that objects associated with Jesus possess healing powers may stem from the biblical story of Jesus healing the bleeding woman found in Mark 5:24b-34, and paralleled in Matthew 9:19-22 and Luke 8:43-48. Mark 5:24b And a large crowd followed him and pressed in on him. Mark 5:25 Now there was a woman who had been suffering from hemorrhages for twelve years. Mark 5:26 She had endured much under many physicians, and had spent all that she had; and she was no better, but rather grew worse. Mark 5:29 Immediately her hemorrhage stopped; and she felt in her body that she was healed of her disease. Mark 5:32 He looked all around to see who had done it. Mark 5:33 But the woman, knowing what had happened to her, came in fear and trembling, fell down before him, and told him the whole truth. This detail in the text implies that Jesus’ healing power can affect people who merely touch objects that touch him, and can do so even when he’s not consciously intending to perform a miracle. Again, in this story, Jesus is like a statically charged doorknob, whose power can be discharged by anyone wearing Uggs on a shag carpet making contact with him. In the story, the woman receives the healing simply by touching only his clothes, and Jesus confirms the act of touching by acknowledging that he felt power go out of him. Because of stories like this, people likely began searching for objects, any objects, said to be associated with Jesus, hoping that they too might be the recipients of the unconsciously administered residual miraculous healing powers of Christ contained within the relics, thereby further confirming faith in Christ to them and to all who might witness the healing. And when we add this story to Old Testament accounts of healing that arise from touching relics, such as the account of a man being resurrected from the dead after coming into contact with the bones of the prophet Elisha as recorded in 2 Kings 13:21, we can begin to understand how the obsession with discovering relics was not just about money, but about a confirmation of a faith that relies on miraculous accounts in the absence of archaeological evidence. Specifically addressing the recent claims of the discovery of a Holy Grail, let me remind readers that we know what common and industrial use cups from first century Palestine look like. 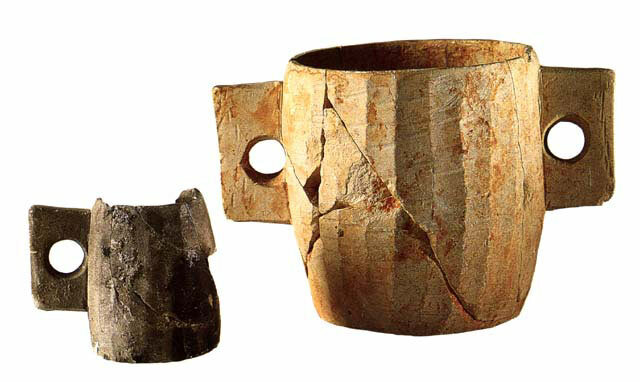 There have been a number of archaeological discoveries that show us what common cups look like, including cups eligible for ritually pure meals. 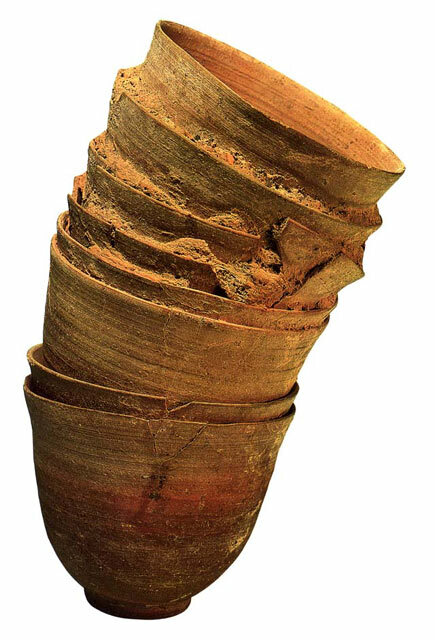 Such vessels can be found in the remains of the Burnt House in Jerusalem, and at Qumran – the site associated with the discovery of the Dead Sea Scrolls – where both stone and ceramic cups have been discovered, and most recently in the Mount Zion excavations in Jerusalem. Let us also recall that Jesus and his disciples were poor, and that Jesus taught a renunciation of wealth (cf. Matt. 6:19, 24; 19:21; Mark 6:8-9; Luke 12:33; etc.). Thus, Jesus and his disciples most likely did not carry with them the sort of bling that is often the focus of grail claims. And let us also remember that the “upper room” mentioned in Mark 14:15 and Luke 22:12 was likely a rented room (some even argue a Sukka) for two reasons. First, Passover was a pilgrimage festival in first century Palestine. They needed to find a place because Jesus and most of his disciples were said to have lived in Galilee and were not from Jerusalem. Second, the Synoptic Gospels all record the story of Jesus instructing his disciples to find a man carrying a jar in Jerusalem who would lead them to an upper room where they were to prepare the Passover meal. Thus, according to the Synoptic Gospels, the room did not belong to Jesus or one of the disciples, but was a room made available to them for the Passover meal during their pilgrimage to Jerusalem. Thus, the cup that was used during the Last Supper was either provided by the owner of the rental room, or by Jesus’ disciples. The latter is not likely because the disciples were not likely to carry expensive objects as Jesus preached a message of the renunciation of wealth. And the former is unlikely because the owners of rooms rented to poor Passover pilgrims in Jerusalem were not likely to lay out the fine China. Next time you stay in a hotel room, look at the quality of the coffee cup provided to you. I’m guessing it’s not made of agate or gold. Thus, if we accept a historical Jesus and a historical Last Supper, the cup used by Jesus would most likely be a nondescript stone cup – the likes of which archaeologists have uncovered in Jerusalem and Qumran and other sites throughout Roman Palestine time and again over the years. These stone cups are usually made of limestone (which is ubiquitous throughout Jerusalem), and are usually carved by paring facets in the cup from top to bottom, forming a roundish cup with handles sometimes carved from the stone. So while gold and silver cups are mentioned in the Bible in connection with the Temple (1 Chron. 28:17) and various palaces (Gen. 44:2), while Roman and Egyptian glass vessels were made at the time, and while expensive precious and semiprecious stone cups were made from onyx, agate, jasper, chalcedony, sardonyx, and carnelian, it is most likely that these expensive cups would not have been used by Jesus and his disciples at the Last Supper. Rather, ceramic, or more likely, limestone cups would have been used for ritually pure meals like the Passover. 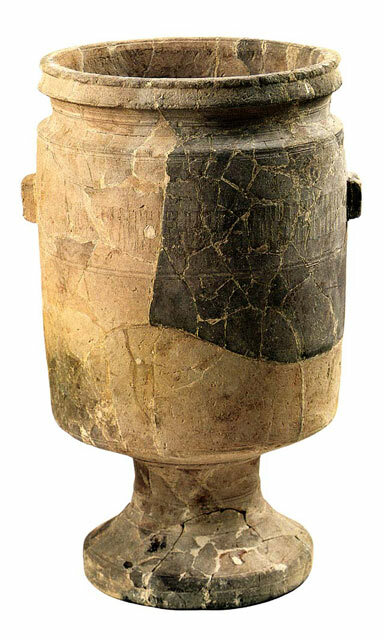 Mishnaic regulations taught that stone vessels were insusceptible to impurities (m. Kel. 10:1; m. Oh. 5:5, 6:1; m. Par. 5:5; m. Miq. 4:1; m. Yad. 1:2; cf. m. Betz. 2:3), while ceramic vessels could potentially absorb impurities into the bodies of the vessels. Thus, because stone vessels were thought not absorb impurities like ceramic vessels, and were therefore preferable for the storage and pouring of liquids, especially in a ritually pure state, one might suspect that the cup used in a Passover meal in Jerusalem in the first century CE would have been made of common limestone, and not of the semiprecious and precious stones that would have been prohibitively expensive to Jesus and his disciples. Likewise, the cup would have been of simple design like the cups we find in archaeological excavations in Jerusalem and Qumran. Finally, because the room was a rented room, the cup was either left in the room (if provided by the room’s owner), or taken with the disciples (if provided my them) after the meal. Either way, we have absolutely no record whatsoever of a chain of custody of any cup used in the Last Supper – an essential piece of evidence necessary to prove the provenance of an archaeological object, and therefore to confirm any credible claim of a “Holy Grail”. So even if – and this is a big IF – there were a Holy Grail, we would have absolutely no way of proving a cup was, in fact, the Holy Grail. Thus, the entire endeavor is sheer and unadulterated speculation. Lest we forget, Easter is approaching. And thus ’tis the season for those who prey on the hopes of the honest faithful to make money by making sensational pseudoarchaeological claims related to Jesus…money made from those eagerly seeking a confirmation of their faith.